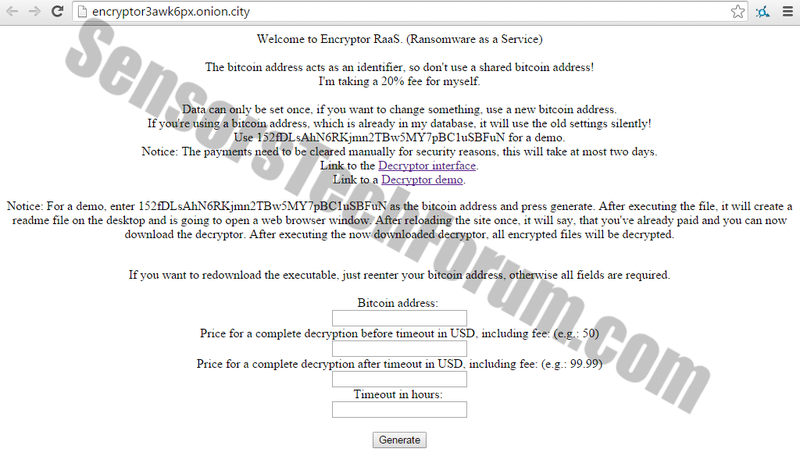 Short Description RaaS encrypts the user’s files but is not a sophisticated ransomware. It may not have affected the Shadow Volume Copies on the system. Symptoms A ransom message is displayed on the user’s desktop. Distribution Method The distribution method of RaaS relies on affiliates. RaaS, or Ransomware as a Service, is a new ransomware that has recently been released in the wild. It is dubbed RaaS for a reason since it allows affiliate parties to generate income by spreading the file encrypting threat. Not surprisingly, the cyber criminals have used the TOR network to host RaaS. Basically, anyone who wishes to participate in spreading the ransomware and making money out of it just has to enter a bitcoin address. The team behind RaaS will then collect and validate the payments, issue decryption keys, and send the money back to the affiliated person. As a result, the person behind the whole RaaS operation keeps 20% of the money obtained from victims. What is Specific about RaaS? According to security researchers, RaaS is similar to the Tox ransomware. RaaS, however, is not that sophisticated at all as it has none-existing affiliate console. Affiliates rely on their own methods of distribution, and they alone have to review the success of infections. Because the distribution of the ransomware executable is done on the affiliate side, the file location or the method of circulation are not known. What Does RaaS’s Ransom Message Say? The files on your computer have been securely encrypted by Encryptor RaaS. Die Dateien auf Ihrem Computer wurden von Encryptor RaaS sicher verschluesselt. How to Remove RaaS and Restore the Encrypted Files? Fortunately, RaaS doesn’t seem to affect or delete the Shadow Volume Copies. So, unless the affiliate knows how to use such protection, the user can restore his files without paying. We have provided a removal manual for ransomware threats that don’t affect Shadow Volume Copies. You can find it below the article. For the sake of your future’s safety, always remember to back up your data to stay protected against ransomware and cyber threats of all kinds. 1. First and most important – download and install a legitimate and trustworthy anti-malware scanner, which will help you run a full system scan and eliminate all threats. 2. Run a second scan to make sure that there are no malicious software programs running on your PC. For that purpose, it’s recommended to download ESET Online Scanner. Your PC should be clean now. Option 1: Best case scenario – You have backed up your data on a regular basis, and now you can use the most recent backup to restore your files. Option 2: Try to decrypt your files with the help of Kaspersky’s RectorDecryptor.exe and RakhniDecryptor.exe. They might help you in the process but keep in mind that they were not specially designed to encrypt information that was decrypted by this particular ransomware. 1. Install the Shadow Explorer, which is available with Windows Vista, Windows 7, Windows 8 and Windows XP Service Pack 2. 2. From Shadow Explorer’s drop down menu choose a drive and the latest date you would like to restore information from. 3. Right-click on a random encrypted file or folder then select “Export”. Select a location to restore the content of the selected file or folder. Remove Encryptor RaaS Automatically with Spy Hunter Malware – Removal Tool. Threats such as Encryptor RaaS may be persistent. They tend to re-appear if not fully deleted. A malware removal tool like Combo Cleaner will help you to remove malicious programs, saving you the time and the struggle of tracking down numerous malicious files. Threats such as Encryptor RaaS may be persistent on your system. They tend to re-appear if not fully deleted. A malware removal tool like SpyHunter will help you to remove malicious programs, saving you the time and the struggle of tracking down numerous malicious files. Note! Your computer system may be affected by Encryptor RaaS and other threats. SpyHunter is a powerful malware removal tool designed to help users with in-depth system security analysis, detection and removal of threats such as Encryptor RaaS. 1. Install SpyHunter to scan for Encryptor RaaS and remove them. 2. Scan with SpyHunter, Detect and Remove Encryptor RaaS. Ransomware infections and Encryptor RaaS aim to encrypt your files using an encryption algorithm which may be very difficult to decrypt. This is why we have suggested several alternative methods that may help you go around direct decryption and try to restore your files. Bear in mind that these methods may not be 100% effective but may also help you a little or a lot in different situations. Note! Your computer system may be affected by Encryptor RaaS or other threats. Remove Encryptor RaaS by cleaning your Browser and Registry. Fix registry entries created by Encryptor RaaS on your PC. Combo Cleaner is a powerful malware removal tool designed to help users with in-depth system security analysis, detection and removal of threats such as Encryptor RaaS. Step 5: In the Applications menu, look for any suspicious app or an app with a name, similar or identical to Encryptor RaaS. If you find it, right-click on the app and select “Move to Trash”. Step 6: Select Accounts, after which click on the Login Items preference. Your Mac will then show you a list of items that start automatically when you log in. Look for any suspicious apps identical or similar to Encryptor RaaS. Check the app you want to stop from running automatically and then select on the Minus (“–“) icon to hide it. Remove Encryptor RaaS – related extensions from your Mac’s browsers. A pop-up window will appear asking for confirmation to uninstall the extension. Select ‘Uninstall’ again, and the Encryptor RaaS will be removed. When you are facing problems on your Mac as a result of unwanted scripts and programs such as Encryptor RaaS, the recommended way of eliminating the threat is by using an anti-malware program. Combo Cleaner offers advanced security features along with other modules that will improve your Mac’s security and protect it in the future. Hey !, I found this information for you: "Remove Encryptor RaaS and Restore Encrypted Files". Here is the website link: https://sensorstechforum.com/remove-encryptor-raas-and-restore-encrypted-files/. Thank you.